Like many of you, growing up Neuromancer played a pivotal role in how we thought about the future and where “cyberspace” was going. Things have turned out very different. Although the underlying mass of data and consciousness is still there, it’s not the fully immersed 3D world some are still clinging to. [William Gibson], author of the seminal novel, has recognized this and readers will find his recent works like Spook Country, are set very firmly in the now, with technology like location sensitive augmented reality. io9 sat down with him during a San Francisco visit to talk about his fondness for Vancouver, the inability of authorities to maintain secrets, if his novels are really dystopian, and whether moving to Canada counts as draft dodging if you never get drafted. You may be hoping to subsidize the purchase of an iPhone 3G with the sale of your old one, but since you should wipe all your personal data from the old one first, we brought you [Rich Mogull]’s method for wiping all your private data off of an iPhone. The method, which involves overwriting your data with music, is slightly flawed, mainly because of live files that can’t be deleted while the phone’s OS is working and because the OS reserves a portion of the hard drive as unwritable space, which will make it impossible to completely fill it with music. For those looking to annihilate every scrap of personal information, check out [Jonathan Zdziarski]’s method. It involves restoring the phone as a new phone, then jailbreaking it. Once the user has shell access, umount is used to force the two mount points into read-only mode. Now the partitions can be overwritten with /dev/zero, which should wipe them clean. The phone should then be forced into recovery mode to perform another full system restore, and the process is complete. As [Zdziarski] notes, several iterations of the process with /dev/random should prevent even NAND recovery, but there is an even better way of ensuring full data destruction: “simply take a sledgehammer to the device.” If you are unfamiliar with the command line though, chances are [Rich Mogull]’s method will be easier for you to handle, but don’t blame us if you sell your phone and the Feds get wise to the evidence you left on it. Download Squad has been publishing an informative series on switching to Linux, and their latest article is about the benefits of web tools on Linux. HTML editors like Bluefish and Quanta do not have all the features of Dreamweaver, but with many modern CMSes these features aren’t really necessary. Other benefits include testing out web pages on your Linux home environment, and adding webhosts as remote locations. This makes management, testing, and deployment easier, and can eliminate the need for FTP software. Bear in mind that the article is only the first part of an ongoing series on Linux web tools, which is itself part of a larger series about switching to Linux. With the iPhone finally getting legitimate GPS we’re bound to see more widespread use of location based apps. Services like Dodgeball, Brightkite, and a few Twitter clients have been around, but failed to tightly integrate with the hosting phone. Now we’re seeing applications that reach beyond just “finding your friends”. [Merlin Mann] directed us to the version of OmniFocus for the iPhone. 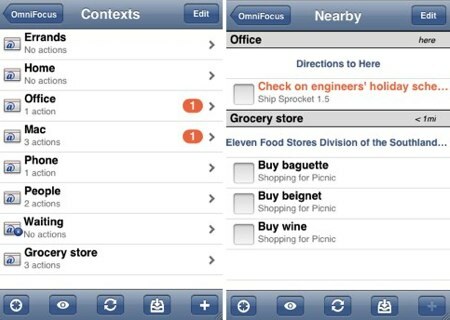 OmniFocus is a task management system that’s now location aware thanks to the iPhone. This means it knows to show you your grocery list while you’re at the store and work tasks while you’re at work. Passive interaction could really make similar systems a lot more enjoyable to use. We think this is just the tip of the iceberg. Imagine alternate reality gaming that gives you a virtual map while you navigate the real world. Geocaching, road rallies, and scavenger hunts could have a running narrative displayed as you progressed. Using technologies like GeoRSS will let us pull data back into the real world making that rare trip outside a lot less painful. We Make Money Not Art recently visited the LABoral Art and Industrial Creation Centre in Gijón, Spain. 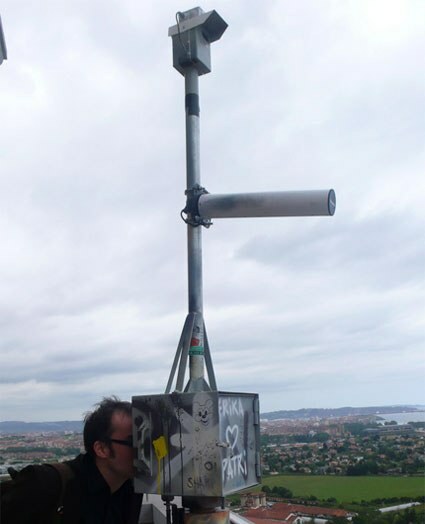 The installation that left the strongest impression on [Regine] was the WiFi sightseeing telescope built by Clara Boj and Diego Diaz. Spain is in a situation similar to the USA: A few years ago many municipal WiFi projects launched only to be squashed because of theoretical unfair competition with local utilities. Now commercial projects like WeFi, Whisher, and FON encourage people to “share” their WiFi. Observatorio (Observatory) is designed to provide insight into the current state of local WiFi. It uses a highly directional Yagi antenna to collect wireless access data from the local area. The antenna has a 30deg aperture which is matched to a camera with an identical field of view. The observer sees the camera’s viewpoint with the WiFi data overlaid showing where accesspoints are and whether the AP is open. WMMNA also recommends you check out the WiFi Camera which photographs electromagnetic space. Today’s episode of BoingBoing TV visits [David Byrne]’s Playing the Building installation which we covered before. The video provides some insight into the artistic process: they wandered around and whacked things with mallets to see what sounded good. They use counterweighted motors to vibrate cast iron girders and columns. Many of the empty radiators are being struck by solenoids. He says the installation is very approachable because people realize that even if a skilled musician sat down they wouldn’t be any better at playing the device. You’ve probably never heard of this obscure new device called the iPhone 3G from no-name manufacturer Apple, but we decided to give a rundown of some of its newest apps anyway. 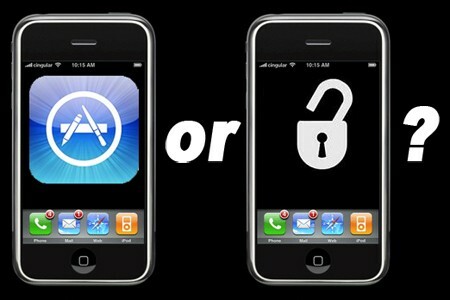 We’ll be comparing them to non-SDK third-party apps that only work on jailbroken iPhones.